While I was binge-watching street style pictures from fashion week this morning, I stumbled upon some looks that were delightfully extravagant. Bursts of colours and, most importantly, prints walking through the grey Parisian streets, turning their backs to countless minimalist souls. What was this thing called normcore again? For the past several years, minimalist styles have been all the rage. 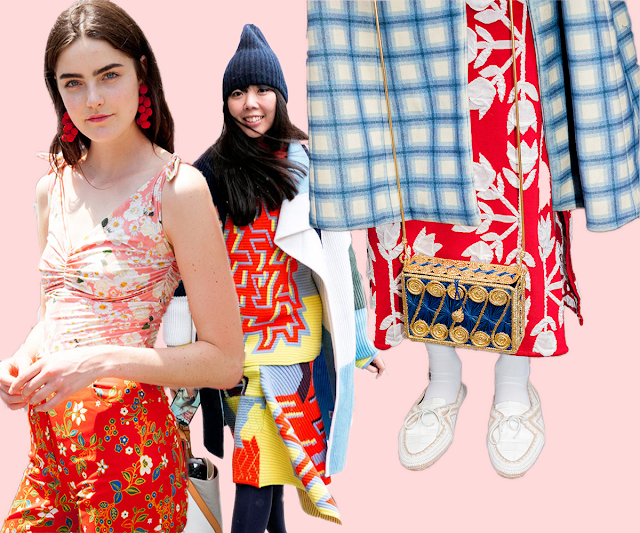 From 'normcore' to colourblocking, trends have been carefully thought-through, almost mathemathic. However, my interest in fashion was sparked by people like Tavi Gevinson or Susie Bubble, who wear the craziest items together and somehow make it work. I find this approach to fashion much more challenging, and even though I don't own many printed pieces myelf, I think print mixing is definitely the most challenging and impressive thing there is in fashion. Hooray! You want to mix it up (just wanted to aknowledge this pun, please read on). But where do you start? My first advice would be to get every single printed/colourful clothing item from your wardrobe to your bed/carpet/desk. Select the colours and prints that look appealing and put the remaining stuff back in your wardrobe, or alternatively, pile them onto that one chair in your bedroom that's pretty much overflowing with clothes right now (that's what I did). Now, put together prints and colours at random, and take mental notes of what looks nice together. When combining different prints, texture is a crucial factor as it adds body to your outfit. I recommend to just go with your gut feeling when combining prints and textures, but if you're like me and your gut feeling just says you're hungry, here are some things to consider. Chunky knits on top and flimsy miniskirts are always a good idea. Colourful fur and high waisted bottoms look killer as well. Texture wise, you can never go wrong with a chunky piece combined with something more elegant, like silk, or you could go another route and combine different knits for a cozy look. The texture tips go for silhouettes as well. Bulky on the bottom, tight on top looks cool, or bulky all over is very streetstyle-worthy. Working with different lengths is a tip I picked up from my favourite website ever, ManRepeller. A floor-length coat with a minidress and knee high boots for example. Or a short jacket, a midi skirt and jeans worn like a layered look is awesome. The more layers you wear, the more complicated your outfits look, however, wearing only two patterned pieces together can be really powerful as well. This step can make or break your printed look. An ineresting bag is a great addition to any outfit, and it can work as an extra print-factor when your beautiful outfit is covered with a coat. Colourful scarves and hats (or even detachable hoods) are eyecatchers as well. Micro sunglasses are all the rage right now, so why not throw in a pair of those as well? Jewellery is another way of adding flair to any outfit, you could wear a bunch of silver rings and earrings like I do, or you could wear colourful beaded bracelets and statement earrings. Just keep this in mind: nothing is too much, nothing. Honestly, who am I to tell you how to dress? I don't even wear a lot of prints, and I truly believe you can put a killer outfit together yourself. I'm just giving you a mere start on your extravagant, colourful journey to print mixing. You can pull off anything. If you feel good and confident in your mixed-print ensemble, you'll look good anyway. Like I said, just go with your gut feeling. Have fun, you crazy colourful chameleon!